The Camellia japonica is a slow-growing shrub with shiny dark green leaves and flowers that range from white to red. With over 3,000 varieties of camellia, you're sure to find one that appeals to your taste. Camellia japonica originate in China and can be grown in U.S. Department of Agriculture (USDA) Hardiness Zones 6 to 9. The best time to prune Camellia japonica is in late spring or early summer, after the shrub has bloomed for the season. Pruning in winter will reduce the amount of fragrant flowers for that season. 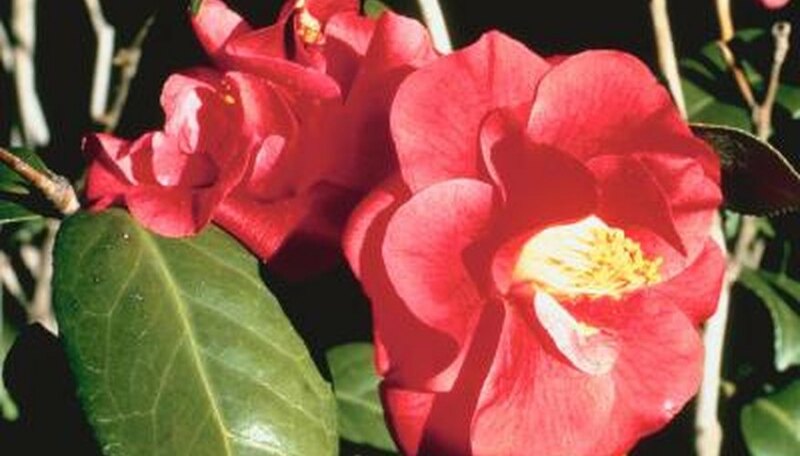 Established camellia shrubs require less pruning. You'll need to remove dead branches and thin out the shrub every other season. Young shrubs require more pruning to maintain a nice structure while continuing to produce elegant flowers. Inspect the branches of your Camellia japonica for dead or diseased spots. You'll need to cut off any dead or damaged branches at their juncture with the main branch. Cut these branches off cleanly and place all cuttings in a trash bag and remove it from the site. If you leave diseased clippings nearby, you'll attract pests. Prepare a 1-to-9 part solution of bleach to water. You'll want to disinfect your pruning equipment between every cut, healthy or diseased, according to horticulturists at the University of Georgia. Trim off small nonflowering branches that are 2 to 4 inches long and grow on major branches. These small branches will never flower and they could become a hot spot for scale, one of the bacteria that affect camellia. Pruning away these tiny branches also promotes air circulation inside the camellia shrub. Wait until mid summer. You'll do a second pruning to get the camellia in shape for winter. Thin out the new shoots that have grown as a result of your last pruning. Reduce the number of shoots so the bush doesn't look ratty. Trim back the tops of the foliage and stems to give the entire shrub an even, neat appearance. These steps should be followed annually for young plants. Established shrubs--those 4 feet or taller--can be pruned every other year or as needed to remove dead or diseased growth.